My daughter left for school at 7:25 am. She messaged me “Daddy, there’s a hornbill outside”. i got the camera and dashed downstairs but the hornbill was not there. It was supposed to be just outside our apartment near the gate. Later, at about 8:05 am, I took my labrador for his usual morning walk. Anna asked me to bring the camera along. I walked around the apartment block where I noticed many of the palm trees were fruiting. A large bird landed on the Tanjong tree in front of me about 3 m above the ground. It was a Southern Pied Hornbill. 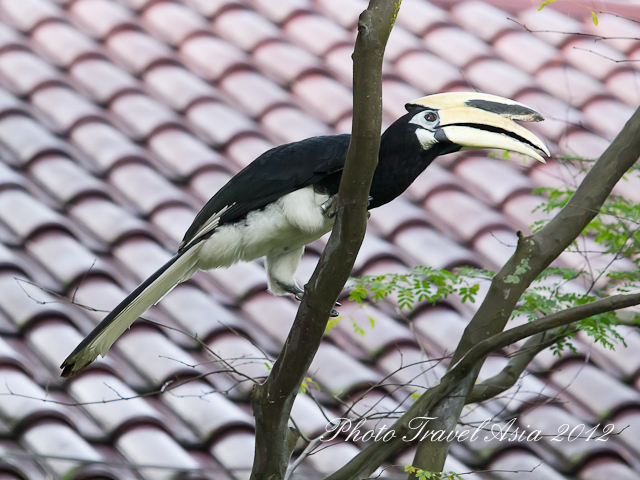 A Southern Pied hornbill @ Orchard Road, Singapore? Looking at the legs closely, I noticed rings attached to them. Probably an escapee. 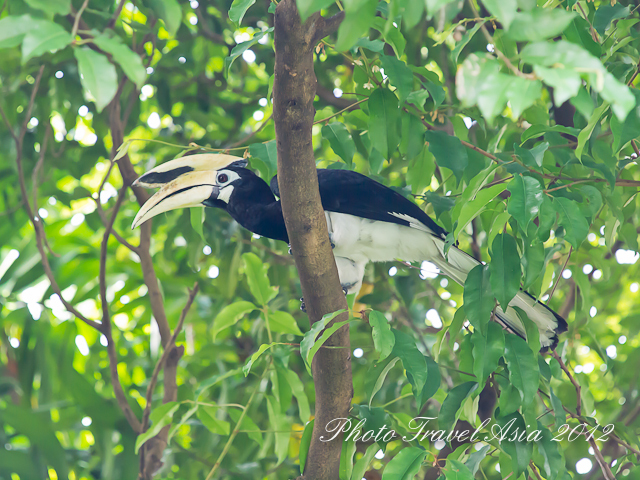 About 8 years ago, my daughter also spotted a Southern Pied Hornbill from her bedroom window perching on the tree behind the apartment. The next tome you come by Orchard Road area,who knows, you may see the Southern Pied Hornbill at Orchard Road SIngapore (instead of Pulau Ubin). Tags: Singapore, Southern Pied Hornbill @ Orchard Road. Bookmark the permalink. Hi Michelle, May be it is the same guy. Another friend also spotted one a few weeks ago near Orchard. The only ID is that both legs are ringed.